SHOWCASE YOUR BUSINESS DISCOUNTS HERE!! As a small business, it's tough to compete with bigger companies. 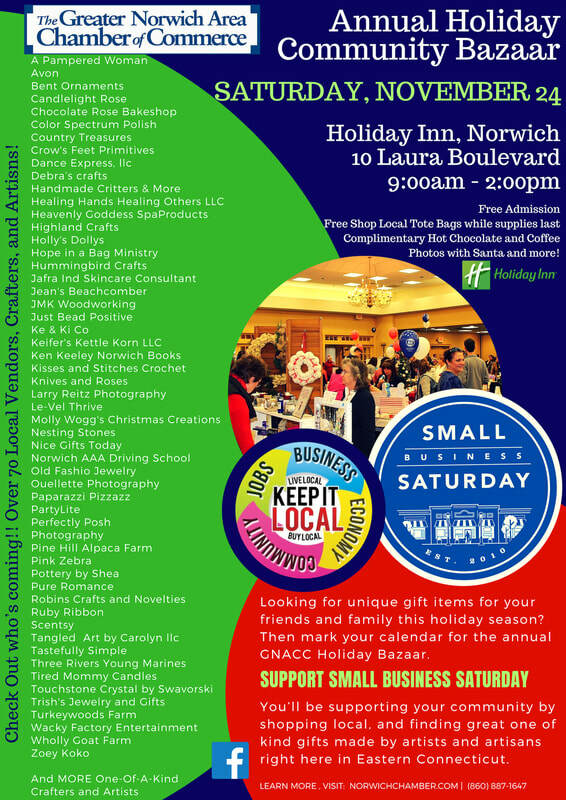 Small Business Saturday® is November 25 and GNACC would like to help YOU SPREAD THE WORD!! Small Business Saturday® is a day to celebrate and support small businesses and all they do for their communities. GNACC would like to know all of your offered discounts and specials so we can help while raise awareness of the importance of keeping it local!! If your business is participating, please email info@norwichchamber.com or call (860) 887-1647. Your offer will be featured on our website as well as on our social media. Receive 20% OFF ALL à la Carte Spa Services, Saturday, November 26, 2016. For reservations, please call 860-425-3500. Make sure to mention "GNACC Small Business Saturday" when making your reservation. Offer valid on à la carte spa and salon services and fitness classes 11/26/16 only. Does not apply to entrance fee or retail purchases. Advanced reservations required. New reservations only. Based upon availability. ​Shop Small is a nationwide movement to celebrate small businesses every day and to help communities thrive. ​Created by American Express in 2010, Small Business Saturday® is the cornerstone of American Express Shop Small efforts. While Small Business Saturday is highlighted as a special day when we can show our support as a nation for small business owners and our communities, the Shop Small Movement is a year-round campaign to celebrate and support small businesses every day.